If you grow up in the eighties or early nineties you probably played R.B.I Baseball. A lot of RBI Baseball. In fact, despite its relatively primitive game play, we ranked it the fifth best baseball video game of all-time. Well, after an almost 20 year hiatus, R.B.I Baseball is back and is now available for purchase on IOS devices — It cost just 4.99 at the Apple App store — and Playstation 3. Those who use xBox One, Playstation 4 and Android devices will have to wait until later this spring. Simplicity has long been R.B.I Baseball’s calling card, and although the 2014 version updates the graphics, it still has the same two-button control that retro gamers lover so much. To play, all you have to do is manipulate the directional pad and the button and the combinations for swings, throws, extra bases etc. are exactly the same as they were in the original game. Like the original, R.B.I Baseball 14 is designed to be fast — you should be able to play nine innings in under 20 minutes. That’s 16 players a team. Eight starters, four reserves and four pitchers. Not enough for the real big leagues but plenty for the video game world. 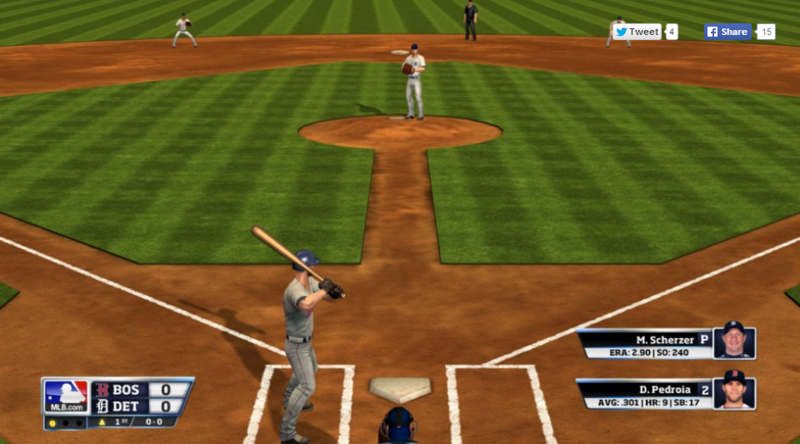 R.B.I Baseball 14 has smartly kept most of the features that made the classic game such a hit. For one, the game features the same three body types: Fat, medium and skinny. You can probably guess which one Pablo Sandoval gets. Clayton Kershaw vs. Mike Trout? Felix Hernandez vs. Ryan Braun? It could very well be the drop ball which determines who will win these R.B.I Baseball matchups. The game doesn’t keep statistics, which could turn off some modern gamers. There, will however, by by online multiplayer functionality later in the year. Check out a first look at the game below.